While looking at some sparrows recently I noticed a few flashing white outer tail feathers as they flew away from me. I used this feature to identify dark-eyed juncos and vesper sparrows in that flock. A little later I startled a Northern flicker off the ground and watched it flash a conspicuous white rump as it again flew away. Still later, a Northern mockingbird flew close in to me as I made some squeaky noises to attract some birds. It perched close and slowly raised its wings to expose large white wing patches. When it finally identified me, it flew away flashing bright white outer tail feathers too. White is a color that is often used in nature to communicate danger or a warning to anything that may be paying attention. Think about when a cottontail rabbit or a white-tailed deer is startled or runs away from you. They too flash bright white as they depart. 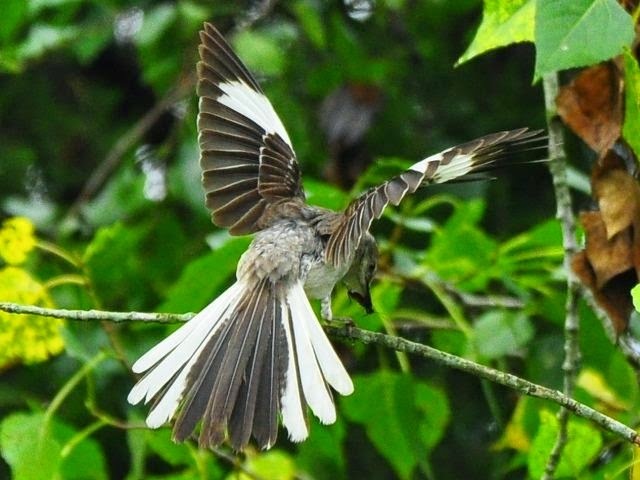 In the case of the mockingbird, the slowly raising of the wings to show off the white patches is a defensive sign and a warning to other birds that they are intruding on its territory. The sparrows and flicker flashing white while they flee are communicating to other members of their flock that there is an imminent threat. It also provides a beacon for the other birds to follow as they all try to escape the threat. There are many other local bird species that have varying amounts of white in the tail. Eastern towhees, American pipits, Eastern meadowlarks, pine warblers, horned larks, and longspurs all have it. Many waterfowl, woodpeckers, white-rumped sandpipers, greater and lesser yellowlegs, black-bellied plovers and loggerhead shrikes, to name just a few more; show white wing or rump flashes. Again these white areas are best seen when the bird is flying away from you. For the birder, these white marks are useful field marks that aid in quick identification. A glimpse of a flash of white in a flushed sparrow flock quickly confirms the presence of vesper sparrows or juncos. Birders use white rumps and white wing patches to quickly identify birds in flight, sometimes at great distances. 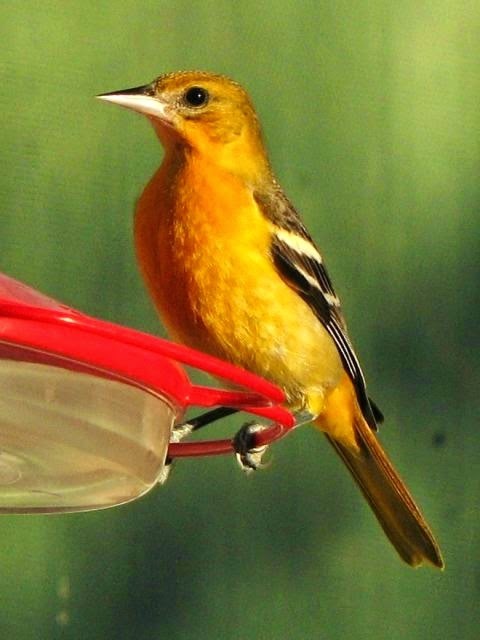 Baltimore orioles can be occasional winter visitors to area feeders. They like a variety of foods; suet dough, sunflower chips, shelled peanut, orange slices, and especially grape jelly are very good at attracting them if they are in the area. And there is potential to attract a rare species of oriole too. 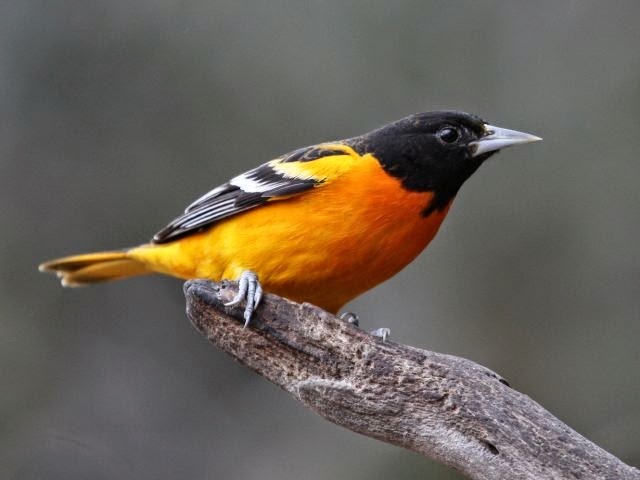 Baltimore orioles occur in a wide variety of plumages based on molt, age, and gender. Below are some frequently encountered plumages. 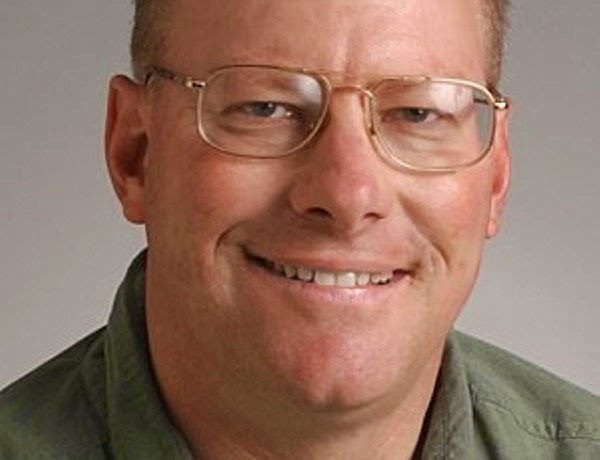 Identification of adult male orioles is pretty straightforward. the more commonly see Baltimore male has the complete black hood. 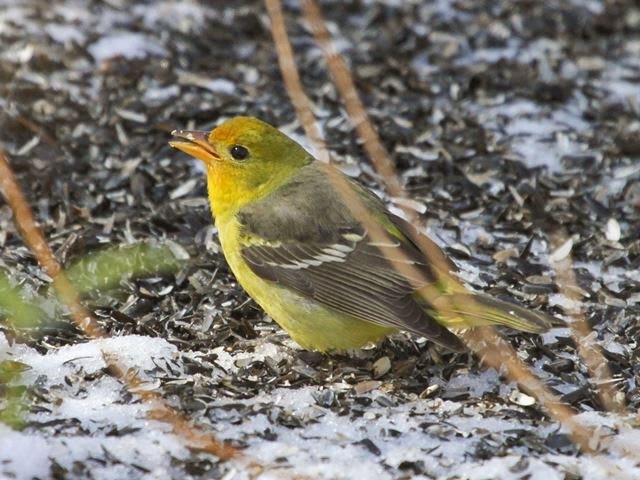 The adult male Bullock's oriole is extremely rare here, but this photo was taken near Southpark two winters ago. Note the orange face and black eyeline and "goatee." Female Baltimores lack the extensive black of the males. Note the strong stripes on the wings and the orange plumage, especially on the upper breast. In this bird, note again the orange tint to the breast. Also note the long, thin bill in both birds. In this immature male Baltimore oriole, the black hood is just now molting in. This bird is not as orange as some but some orange feathers can be seen coming in on the chest. 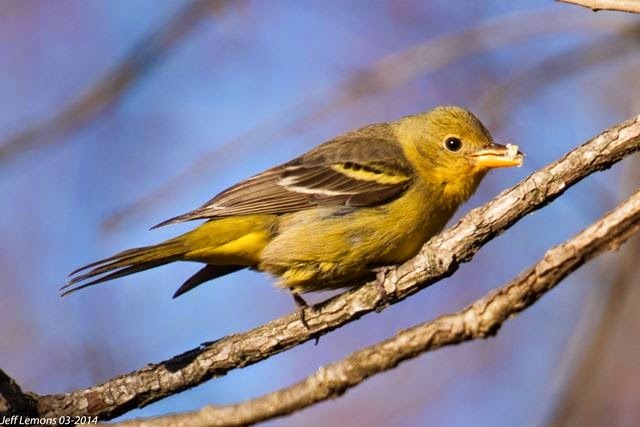 And always be aware of the possibility of a Western tanager visiting your feeder. 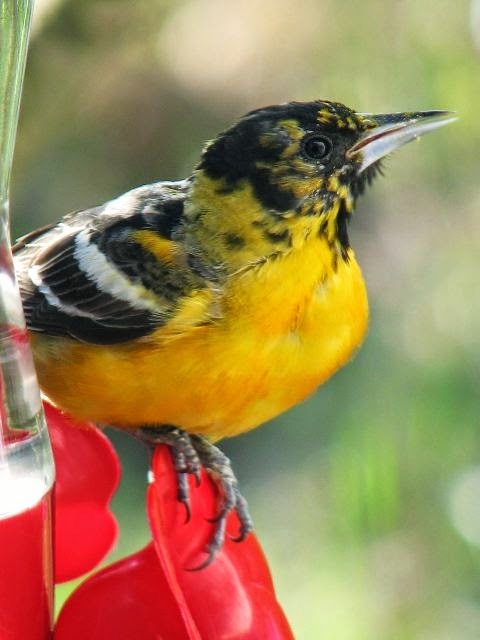 As in orioles, the adult males are strikingly colored and identification is usually easy. There will be at least a hint of red in the face. This photo was taken in Mecklenburg County a few years ago. The more likely to be seen females and immatures may resemble this duller bird below. Note the greenish yellow plumage and two wing bars, the upper one being yellowish, the lower being whiter. Also notice the bill is shorter and thicker. Western Tanager by Jeff Lemons. In this immature male below, note again the yellow upper wing bar, brighter greenish yellow plumage, and a hint of red coming in around the face. We have gotten off to an early start for really cold weather this winter. As freezing mornings get more frequent, it is important to remember that our area birds need water as much as they need feeder food, maybe even more. Heated bird baths are great, and if you are thinking of investing in one you should not be disappointed if you opt to purchase. But just supplying water in a shallow pan or conventional birdbath during the winter can be just as rewarding, especially during bouts of snow and ice. You might also attract species that may not normally visit feeders. American robins and cedar waxwings are frequent patrons of provided water in the winter. Check out the photos from our area and see for yourself. So this really is going to be the cold blast that will bring any hummingbirds in the area to feeders. Arctic air streaming in today and tomorrow, along with an even colder shot next week will be a hummingbird express. 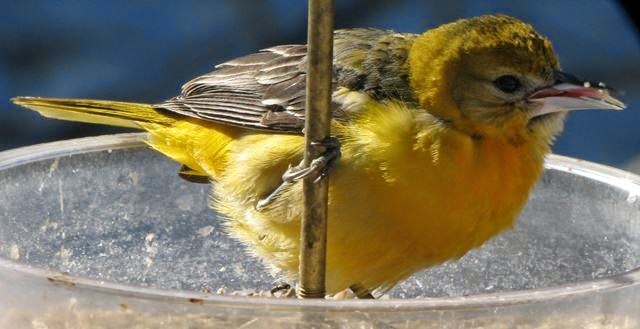 Keep the feeders thawed and your eyes on them this weekend. Let me know if you see anything. I have mentioned the rufous hummingbird as the most likely species to show up, but other rare species come too. 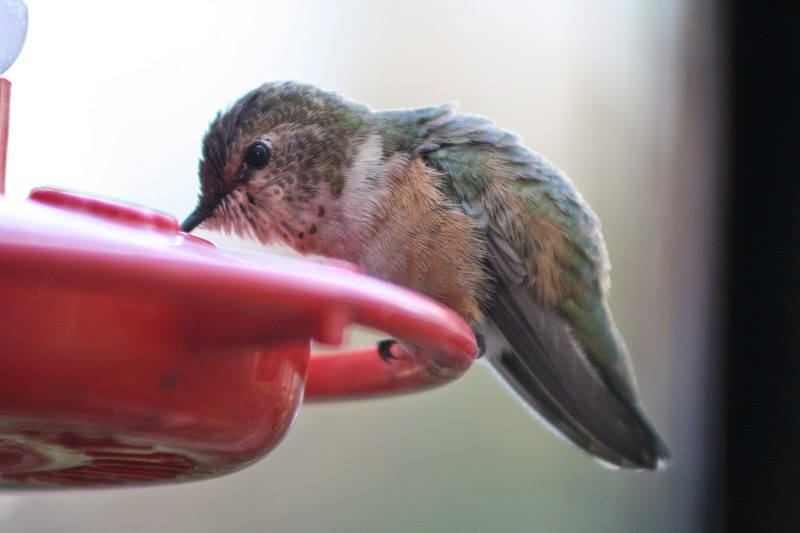 Last year a calliope hummingbird spent the winter in Mecklenburg County. Below is a photo of an immature male calliope hummingbird that spent a winter in Union County a few years ago. Notice the few magenta feathers coming in around the throat. Their elongated shape, along with more subtle identifying features, made this ID easy. The calliope hummingbird is the smallest bird that regularly occurs in North America. The first winter hummingbird report of the season came in to me yesterday; a female-plumaged bird off Rea Road in south Charlotte. The observer reports obvious rufous plumage on the flanks. This location is smack dab in the middle of the Mecklenburg County hotspot for wintering hummingbirds. Though it is very likely a rufous hummingbird, it will be impossible to tell exactly what it is until a definitive photo is taken or the bird can be observed by an experienced birder. Even then, it may be difficult. The rufous hummingbird belongs to the genus Selasphorus, which includes several other closely related species. The adult males are easy to ID, it is the female-plumaged birds that present challenges. To be accurate, it is best to call them Selasphorus hummingbirds until a specific ID can be made. If this winter is like the 2013-2014 season, dozens more birds will be discovered in the next couple of months. Keep a watch on those feeders!